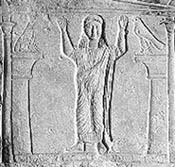 The orans (latin, prayer) gesture is an ancient mode of prayer common to many ancient religions. It is performed standing, elbows bent or at the side, with arms uplifted and palms upward- a gesture of supplication or pleading. Why was the orans position gradually replaced when it was so widely practiced in the beginning? In fact, it’s practice extends back much further, as this article points out, that the gesture is “common to many ancient religions,” and shows one example from the funeral stele of an Egyptian woman (shown on the right). Cyril thus identifies these worshipers as acting out some kind of vicarious work, doing for the dead “what a loving God requires,” by making available to them the Atonement. Nibley notes that “Cyril does not mention the list of names on the altar in this account, but he does elsewhere, referring to this very custom and specifying separate lists for the living and the dead”9. What a magnificent photo image! That would make a great heading for your blog, at least temporarily. Thanks. I got the image from here. It is a great example of the orant posture of the early Christians. I L O V E your site! This gesture can be seen repeatedly (from a side profile view) in Egyptian Religious text, look up “The Egyptian book of the dead” — The papyrus of Ani — for example. It is common in most portraits of candidates being lead to or approaching judgment (in white pleated robes), of course it isn’t called an Orant gesture. Also in Egyptian art the “Ka” (spirit) symbol or gesture is two arms to the square. I believe FARMS has a study on Egyptian incense burners being fashioned in the form of a cupped hand. I look forward to your views and comments on these in a future post, perhaps Orant parts 2, 3, 4, 5. Thanks John!! I’m glad you like it. Thanks for your comments too. You are definitely right. The gesture of uplifted hands can be seen in much of the Egyptian material. I’m sure I’ll get to other representations of the gesture in future posts. The papyrus of Ani is certainly a good example, where the initiates are led towards the king on the throne, and are clothed in white pleated robes, one of them forming the Ka symbol. You can see a great example of this papyrus here. Here is another good example. The Egyptian “Ka” is a gesture of two uplifted hands, and can also be interpreted as a symbolic embrace. Here is a good webpage introducing the Ka symbol. Incense was often burned in special holders made in the form of a cupped hand, the “golden spoons” of Exodus 25:29. From the Egyptian version (A) at Beni Hasan, c. 1100 B.C., to an actual steatite example (B) found at Meggido, the “filled hand” . . . is the widespread sign of offering sacrifice. Thanks for stopping by Temple Study. Feel free to comment often. Fascinating. It is interesting to see how most, if not all, religions are related in one way or another. When we recognize the fact that no matter what our religion, we are worshiping the same deity. That deity gave our original parents certain customs and rites the they were to perform. These were passed down through the ages and just as stories always change with the each person who repeats them from memory, so have these customs and rites been changed and adapted. The fact that so many of them are still around and so very close to the original is also very interesting. We really are all brothers and sisters with the same Heavenly Father. Our differences come from the upbringing and environment. Further on: “Let us then draw near to Him with holiness of spirit, lifting up pure and undefiled hands unto Him, loving our gracious and merciful Father, who has made us partakers in the blessing of His elect.” (The Ante-Nicene Fathers, (Grand Rapids, Michigan: WM. B. Eerdmans Publishing Co., T&T Clark, Edinburgh, reprinted October 1989), 1:5, 12, The First Epistle of Clement to the Corinthians, chapters 2; 29). Clement of Alexandria, A.D. 153-193-217, wrote how they “raise the head and lift the hands towards heaven, and stand on tiptoe as we join in the closing outburst of prayer”. He also wrote: “Come to our mysteries and you shall dance with the angels around the Unbegotten and Eternal one, while Logos of God sings along with us. . . the great High Priest of God, who prays for men and instructs them.” (The Library of Christian Classics, vol.2, Alexandrian Christianity, Selected Translations of Clement & Origen with Introductions and Notes by John Ernest Leonard Oulton, D.D., Regius Professor of Divinity in the University of Dublin; Chancellor of St. Patrick’s and Henry Chadwick, B.D., Fellow & Dean of Queens’ College, Cambridge. (Philadelphia: The Westminster Press). vol. 2, p. 117, Clement of Alexandria, On Spiritual Perfection, chapter 7, see also note 37 on p. 117: Cf. Origen, de Orat., 31, below, p. 322 ff. Clement of Alexandria, 2nd century, Cohortation ad gentes, xxi, in Migne, PG 8:241. 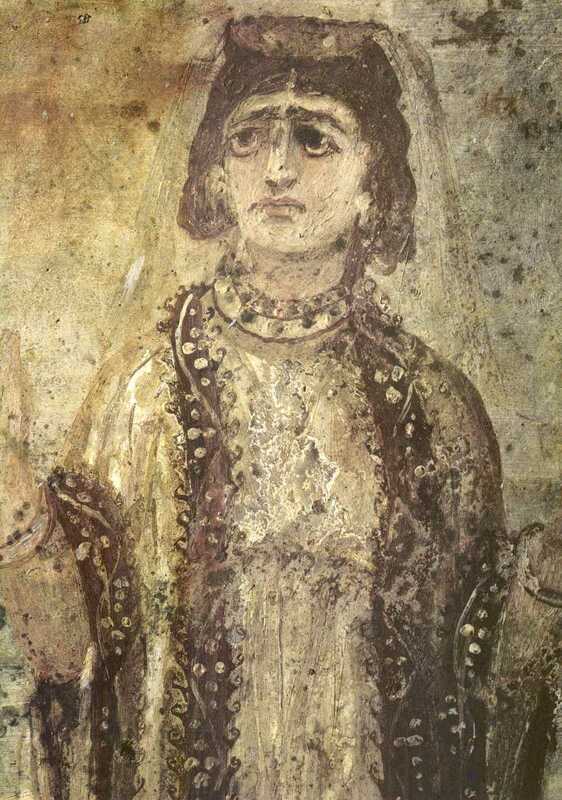 In the third century catacombs, St. Callistus, Rome, is a fresco of a Christian woman, praying with up-lifted hands, and veiled. veiled Mary with up-lifted hands praying. Another veiled female orant with up-raised hand in prayer. Marion P. Ireland, Textile Art in the Church, Vestments, Paraments, and Hangings in Contemporary Worship, Art, and Architecture, (Nashville and New York: Abingdon Press, 1966, 1967, 1971), pp. 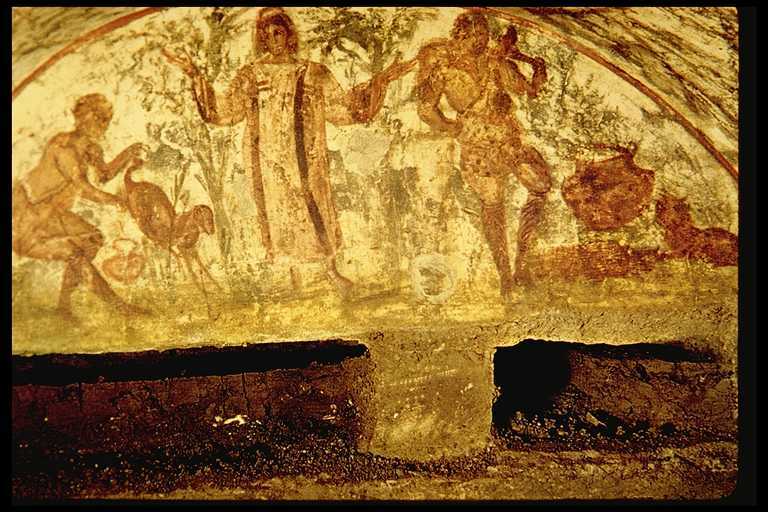 56—57, illustration 30: Fresco in the Catacombs of St. Callistus, Rome. Praying figure with up-lifted hands, wearing a see through veil on her head. The orant gesture is mentioned numerous times in the Bible. Here is a good list: Gen. 14.22, Deut. 32.40, Exo. orant gesture is mentioned in Nibley’s Temple and Cosmos also. I hope these help anyone who visits this blog.